Southern California winters are very close to perfection. Sure, we grumble when the temperature dips below 65º and try to be happy when the rains come, knowing that to complain of rain during a drought is truly looking a gift horse in the mouth. 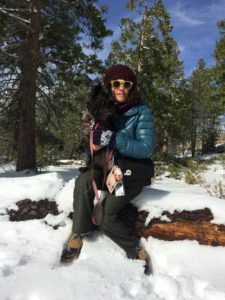 Even with mostly blue skies, many of us who grew up in colder climates have a certain nostalgia for true winter weather, even if we swear we’d never live with it again. Snow was bittersweet growing up in New York State. The first snow: magical, Christmas snow: necessary, blizzards & school snow days: exciting. But other than that, snow is a drag. Digging out, shoveling sidewalks, scraping off windows, de-icing car locks, driving and walking in it finally culminates in the depressing month of February, when the melting, slushy snow is dirt grey and you just want it to disappear. 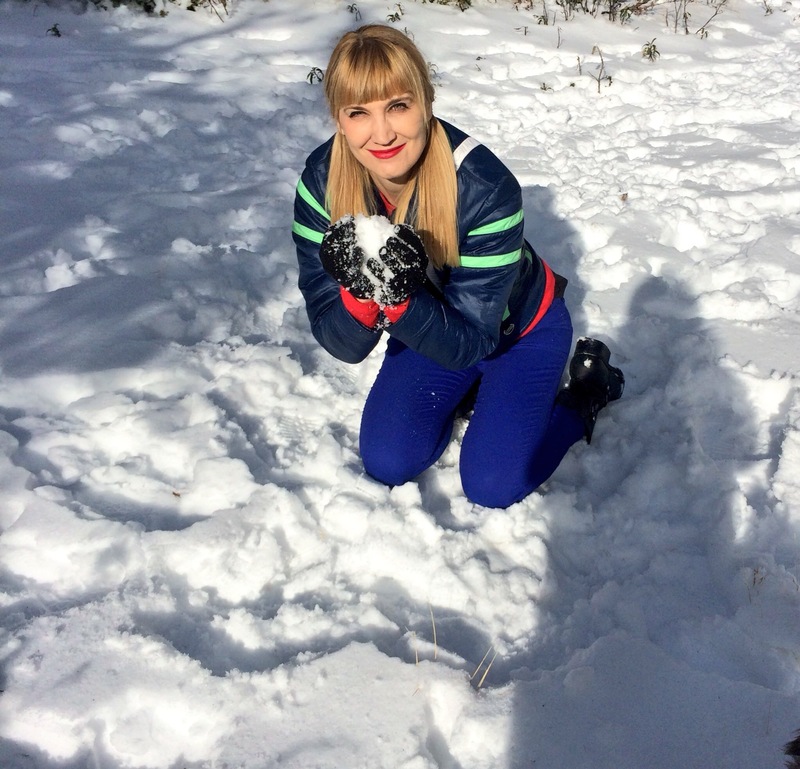 To be able to visit the snow and experience its fun without the daily drudgery is really the ideal situation. That is only one of the reasons we’ve got it so good in Los Angeles. This expresses itself in the long held brag so casually tossed at friends and relatives who are shivering in sub-zero temperatures. 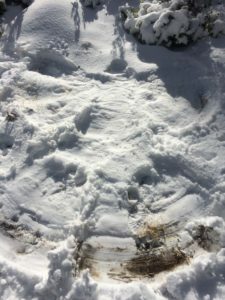 We like to let them know that we’re not missing out on the good stuff when we boast that we are able to take a swim in the ocean and a romp in the snow all in the same day. It is true. The snow is a very short drive away, a quick afternoon getaway and provides some much needed escapism. Just above the 210 freeway in La Cañada, a few miles from downtown and the Valley, stands the San Gabriel Mountains. 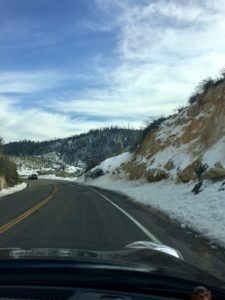 Taking the Angeles Crest Highway exit from the 210 freeway and driving 15-20 miles through the curvaceous roads of the Angeles National Forest will take you to the snow line, which gets lower after heavy winter rains. Here you can build a snow man, throw snow balls, do some sledding, or merely breathe in the fresh cold air and contemplate life. The drive up Angeles Crest Highway is full of gorgeous mountain vistas and many scenic view points. The road is one lane in each direction, with double yellow/no passing lines, so speeds do not normally get above 20-30 mph. You will begin seeing patches of snow less than 10-miles up, but the higher you go, the deeper and more solid you’ll find the ground cover. There are many picnic areas and campgrounds which have accessible parking areas and you will pretty much have your pick as to what looks and feels right to you. 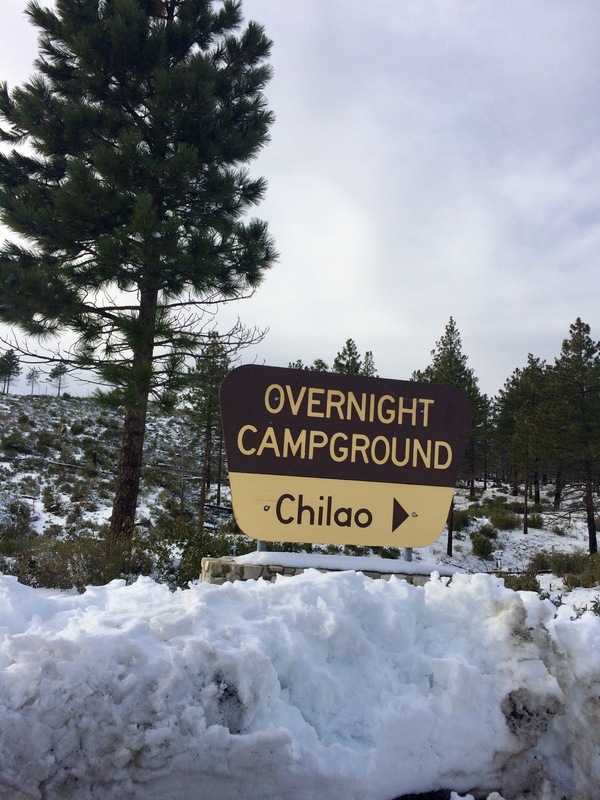 We turned off about 26 miles up at Chilao Campground in Little Pines at 5,300 ft elevation, which had just the right amount of low hills for light sledding and had many families enjoying the outdoors. The area is spacious, dotted with pine trees and yucca and apparently bighorn sheep, which we unfortunately did not see. About a mile past Chilao is the infamous Newcomb’s Ranch, a wood paneled restaurant with a fireplace, originally built in 1939, and one of Los Angeles’ Oldest Surviving Restaurants. Open Thursday-Sunday it is a great destination for bowls of chili, burgers or whisky laced Irish Coffee. Slightly further up the road is Mt. Waterman Ski Lift which has 25 ski runs and 3 chair lifts, but no equipment rentals. The peak was named after Liz Waterman, who in 1889 was the first non-indigenous (aka Caucasian) woman to cross the San Gabriel Mountains. The ski lift was built in 1939 by the Newcomb family who also founded Newcomb’s Ranch restaurant. Because these ski slopes depend on all-natural snow rather than manufactured, they may open late in the season, or sometimes not at all. When it is operating, the chair lift ride, which takes you high into the tree line, is a fun adventure, and worth the small fee. 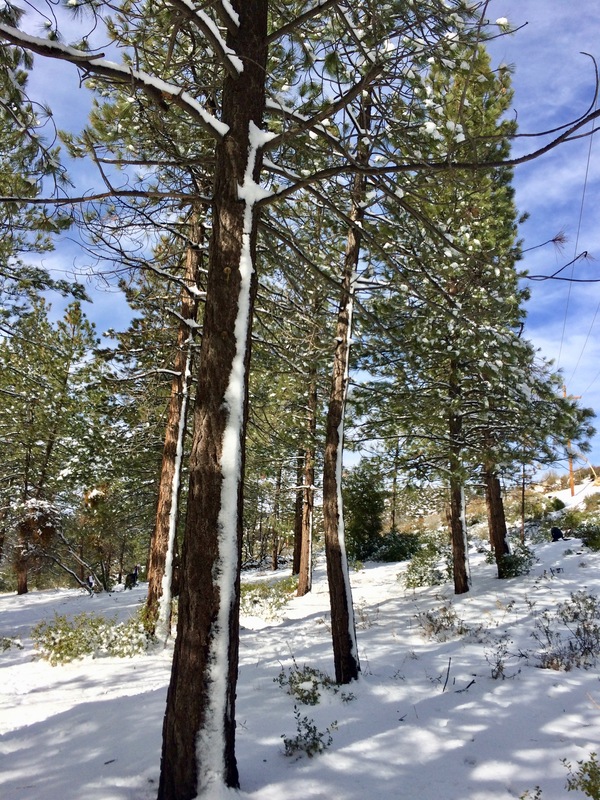 So take a break from our consistently moderate weather for a few hours and visit our Southern California snow. Pick up a cheap plastic sled from a sporting goods store, bring a thermos of hot cocoa and make it even more fun. Make sure to follow tradition and build a small snowman on the hood of your car before you decide to head home. Part of the fun is watching it melt when you descend back down to our Los Angeles paradise. 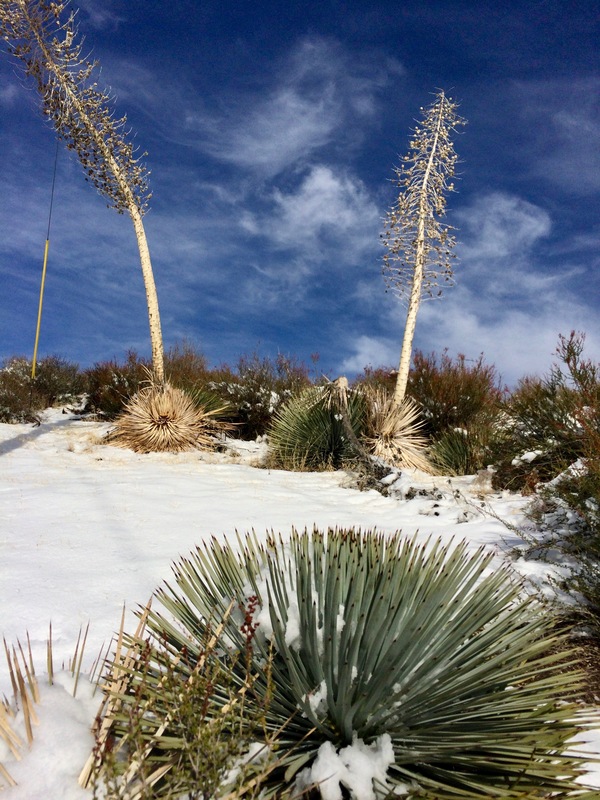 This entry was posted in Attractions, Miscellanious, Offbeat LA and tagged Angeles Crest, Nicole Kreuzer, Nikki Kreuzer, Offbeat L.A., Snow. Bookmark the permalink.